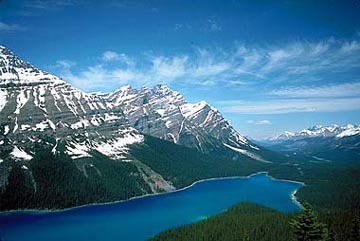 Peyto Lake © Just one of the side trips recommended by the editors along the Icefields Parkway. In winter on a crystal clear day, or in summer when the sun is high in the sky, there is no sight more breathtaking than the mountains and glaciers of the Icefields Parkway (#93 North). From Lake Louise, it is only a five minute drive west on the Trans-Canada Highway (#1) to the turnoff for jasper via this scenic route. If you have any option at all, try to make this trip on a clear day, but sometimes cloudy days will still provide views of the tops of the mountains. Hanging glaciers adorn many of the peaks and, every once in a while, glaciers that spill from the icefields beyond come into view. Anytime you see thick white or blue, you are looking at a glacial ice. In the course of a day trip from Lake Louise, you should be able to make it to the Columbia Icefield area and back again, which is the most scenic part of the parkway. Allow for 1½ hours of driving time each way, and add on for stops and winter driving conditions. For a trip all the way to jasper, budget three hours of driving time under good conditions. The highlight of the parkway is, of course, the Athabasca Glacier which comes tumbling off the Columbia Icefield directly towards the road. Nowhere else in the Rockies is it possible to get a view that encompasses more ice. The Icefield Visitor Centre has excellent exhibits that help you explore the exotic world of perpetual cold.